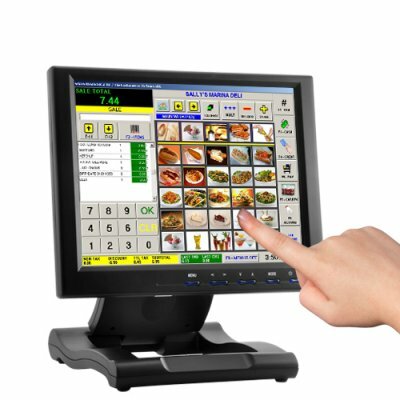 Successfully Added 10.4 Inch Touchscreen LCD with VGA, HDMI, DVI, AV, and YPbPr Inputs to your Shopping Cart. This is one powerful touchscreen LCD monitor with the most input options ever on the market. With VGA, HDMI, DVI, AV, and YPbPr, you can basically connect any of your electronic devices to this touchscreen display for both play and business. FOR PLAY: This screen is collapsible to behave like a 10 inch tablet so you can draw or perform a variety of tasks on it. This is great for artists and graphic designers. Why waste time sketching out your ideas on paper and scanning them when you can now sketch right on the screen! Kids will love it too. Open up Microsoft Paint and let them screen finger paint. Great for hours and hours of fun! What’s better, you can connect this monitor with your computer and function as a touchscreen display, instantly turning this baby into a tablet computer. This is extremely useful when you want to stay in bed on lazy Saturday mornings. Play games, watch movies, chat with friends, updating Facebook…do everything you can do with your PC, but in iPad style! FOR BUSINESS: With touchscreen functionality, this baby transforms into an ideal POS (Point Of Sale) business solution. POS screens are revolutionizing how quickly business is done in the entire retail business realm. Double and triple your volume and keep your customers happy with this touchscreen solution! It's also great for mall booths and kiosks selling everything from lottery tickets to cigarettes! Whether you're in retail sales or provide consulting solutions for the industry, add this point of sales phenomenon to your arsenal to increase sales, improve the customer service experience, and minimize cash transaction losses. Click on "Add to Cart" right now to try out this amazing product for yourself. Then order some more to stock in your store because this is a truly high margin potential product that will help you stand out from your competitors and net you some nice profits. Once again, the amazing is possible, only at Chinavasion.com! You can use the included stylus or your finger to click on icons, enter onscreen numbers, anything you'd normally do with a mouse and keyboard! Need a bigger, better viewing experience? Try our identical 15 inch version [CVJU-E38] or 17 inch version [CVJU-E129]! How do you right click using this touchscreen? Instead of tapping the screen, place your finger on the screen and wait. In one or two seconds, the right click menu will appear. Can this monitor help me spend quality time with my children? Definitely. Know what an Etch-A-Sketch is? This is the ultimate Etch-A-Sketch. Just open Microsoft Paint or some other drawing program and let your kids express themselves. This is better than drawing with a mouse, since children have trouble grasping the finer points of mouse usage whereas a touchscreen monitor is as intuitive as...playing with food. What else can I use a touchscreen monitor for? For starters, you can finally have a real signature appended to your emails. Just write on the screen. In addition, many banks and institutions require signatures even for electronic communications. That won't be a problem anymore.